Nossos comentários e atualizações semanais permanecerão gratuitos até 22 de abril de 2019. A partir de 22 de abril de 2019, será necessária uma assinatura para recebê-los. Qualquer pessoa que se inscreva antes de 30 de abril de 2019 receberá uma assinatura anual com uma taxa de desconto de US $ 99 / ano. É claro que os clientes da Fundamental Analytics e do BlackSummit Financial Group continuarão recebendo nosso conteúdo semanal gratuitamente. Antes de 2014, o petróleo bruto produzido nos EUA, por lei federal, não podia ser exportado. 3,39 milhões de barris por dia (Gráfico 1, linha preta). devem ficar acima de US $ 60 o barril. Prior to 2014 crude oil produced in the US by federal law could not be exported. When the law was changed in mid-2014, US crude exports increased to about 0.5 million barrels per day. 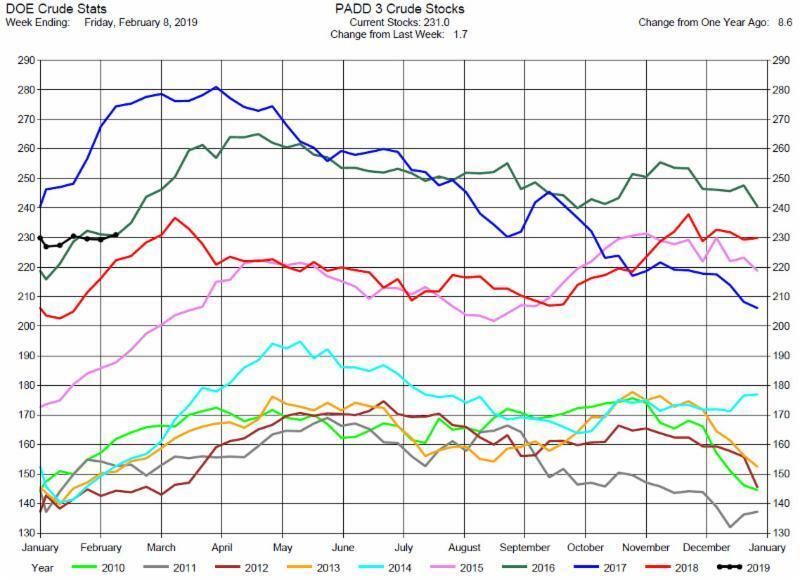 Starting in mid-2017 with increasing domestic shale production of crude oil, crude exports increased dramatically to 3.39 million barrels per day (Chart 1, black line). 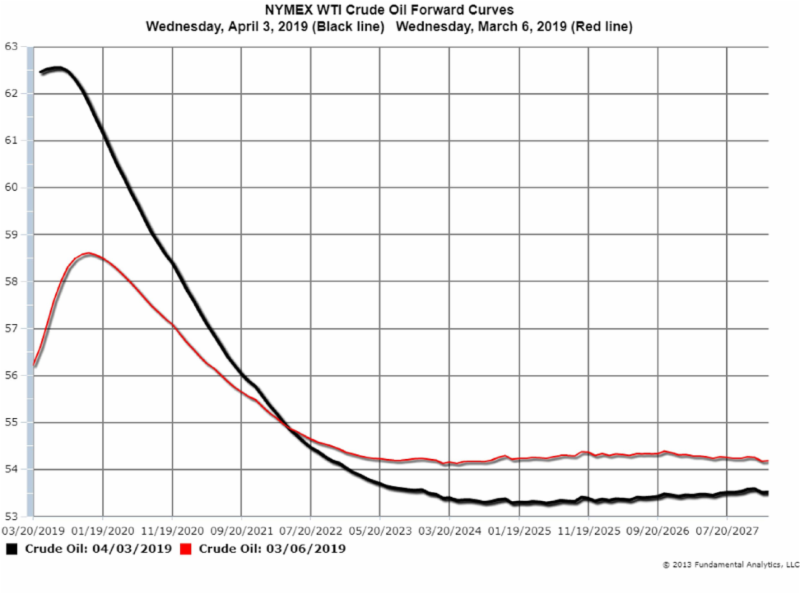 With record crude oil production for supply, crude stocks can be at lower levels (Chart 1, red line). With strong exports and lower levels of crude stocks, US WTI crude oil prices will be supported and can be expected to stay above $60 a barrel. 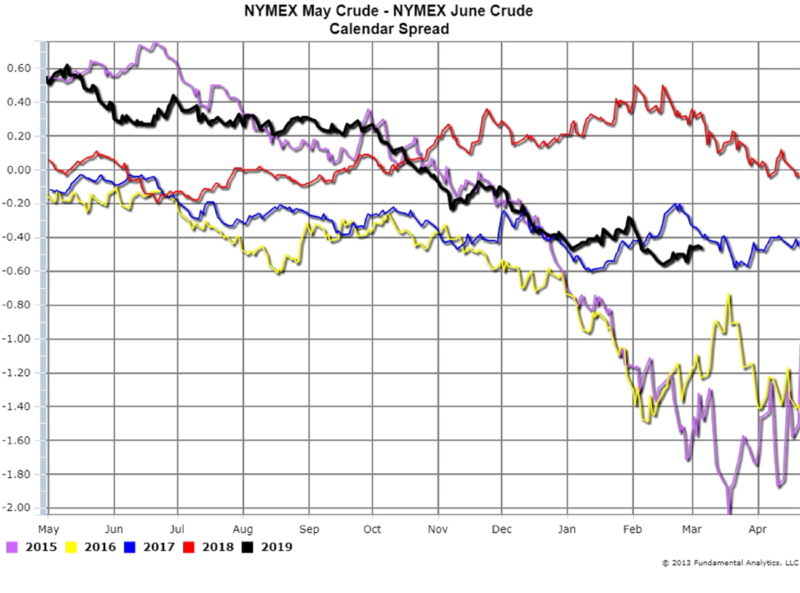 The calendar spread of NYMEX May Crude – NYMEX June Crude for the 2019 contracts has decreased from positive 60 cents last May (Chart 1, black line) to negative 39 cents as of March 5. These calendar spreads of consecutive months are often called “front-to-back” spreads. 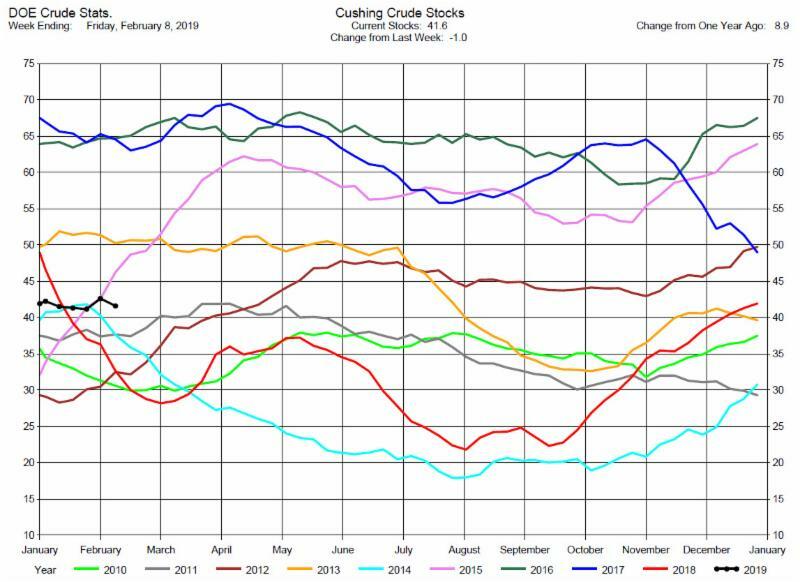 The value of the front-to-back spreads often is inversely correlated to crude stocks at Cushing, Oklahoma (Chart 2), the delivery point of the NYMEX crude oil contracts. As stocks increase at Cushing, there tends to be downward pressure on the front-to-back spreads. 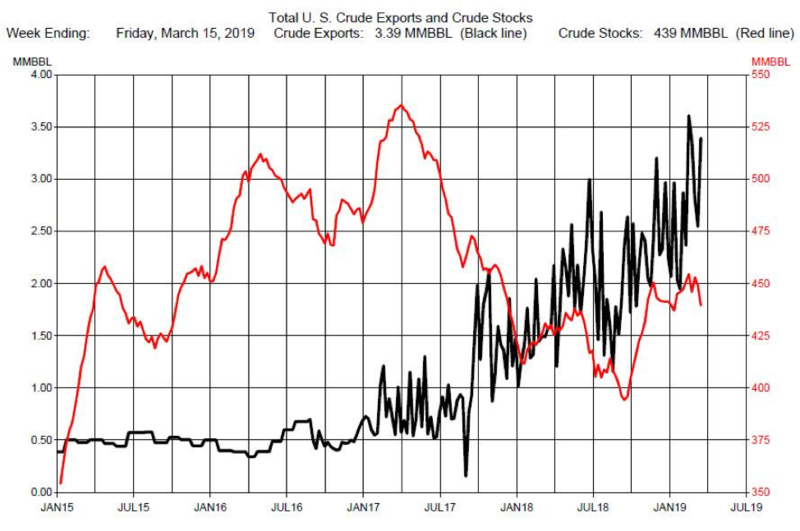 Cushing stocks have been increasing since last August, from 20 million barrels to 47.5 million barrels as of March 1 (Chart 2, red and black lines), and correspondingly the May-June Crude spread has been decreasing. 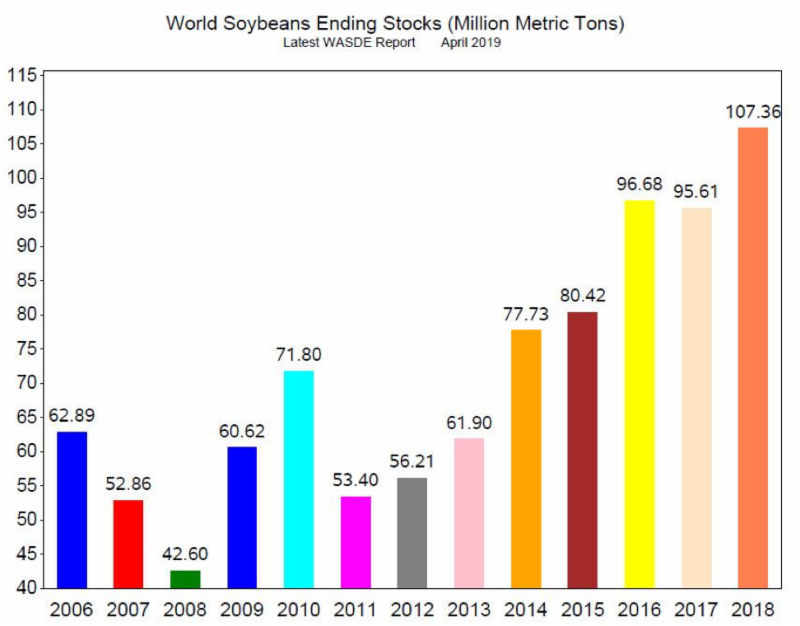 See the Chart 3 scatterplot of this inverse relationship. 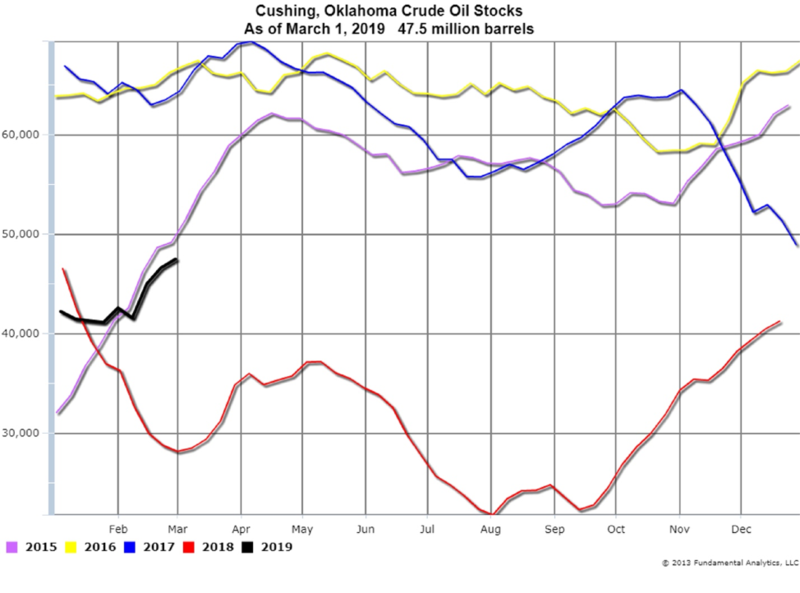 Should the Cushing stocks continue to increase, as we expect, this will continue to pressure the front-to-back crude calendar spreads. preço com a divulgação do relatório. favoráveis aos preços do milho. spread entre março e abril se torne mais negativo. 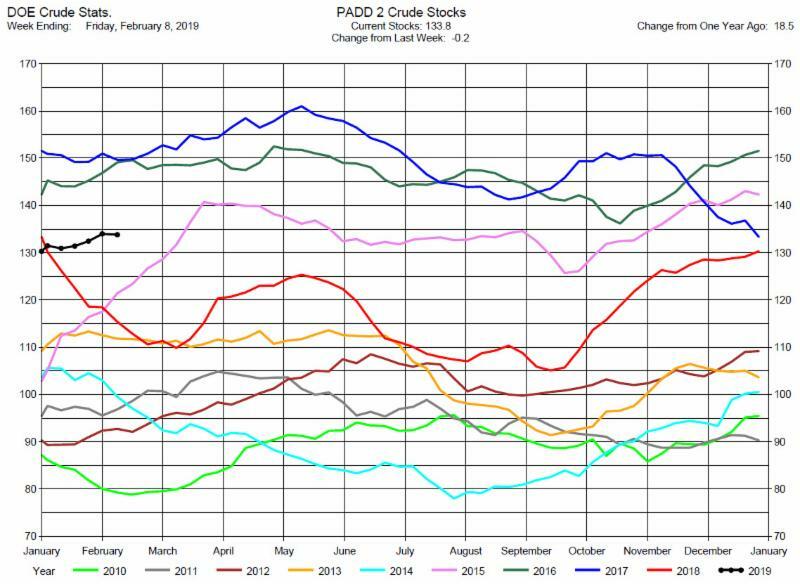 The DOE reported Total Crude Oil Inventories increased by 3.6 million barrels to 450.8 million barrels for the week ending February 8, 2019, while the expectations average was for a 2.7 million barrel build. Overall hydrocarbon supplies increased by 6.5 million barrels to 1,266 million barrels. 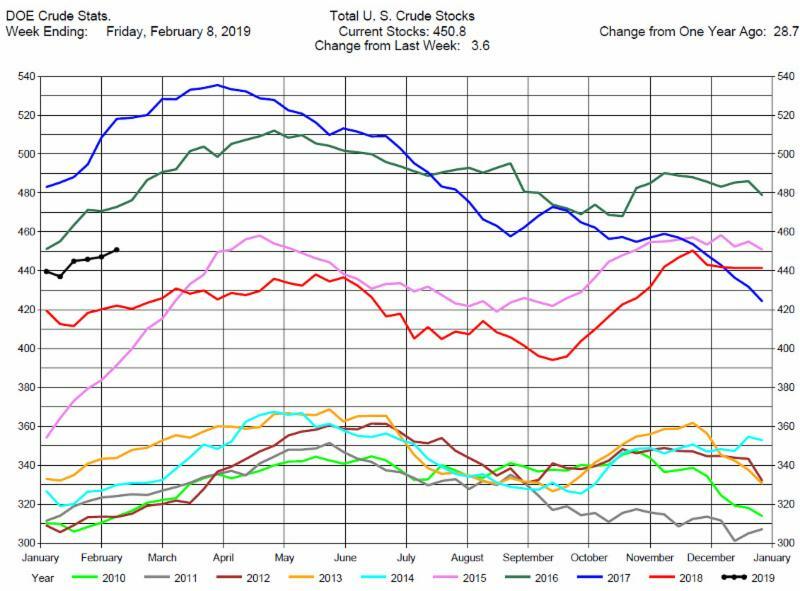 Crude Oil Production remained at 11.9 million barrels per day. Total Crude Imports decreased by 900,000 barrels per day to 6.2 million barrels per day, a record low for this time of the year. 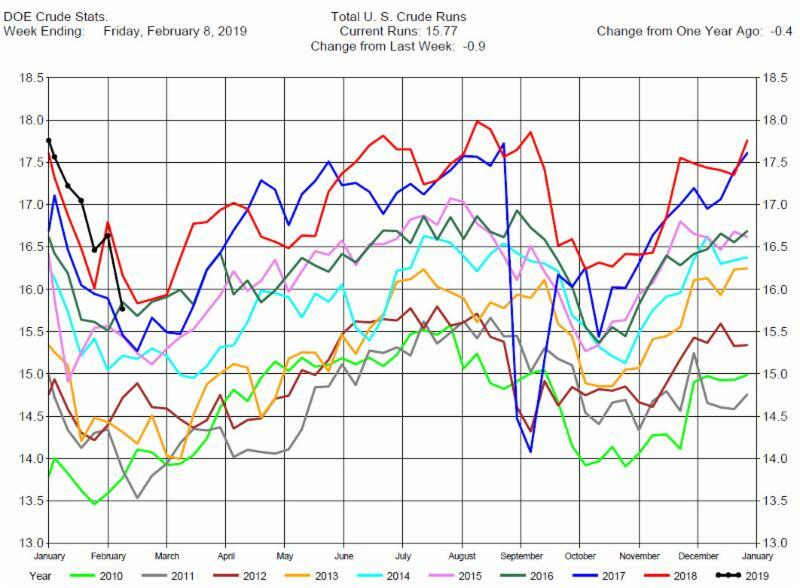 Total Refinery Crude Runs were down 900,000 barrels per day to 15.77 million barrels per day. The crude oil stocks build was bearish to crude oil price, but news reports of the Saudis reducing crude exports and cutting production supported the market. The build came despite the record low in crude imports. 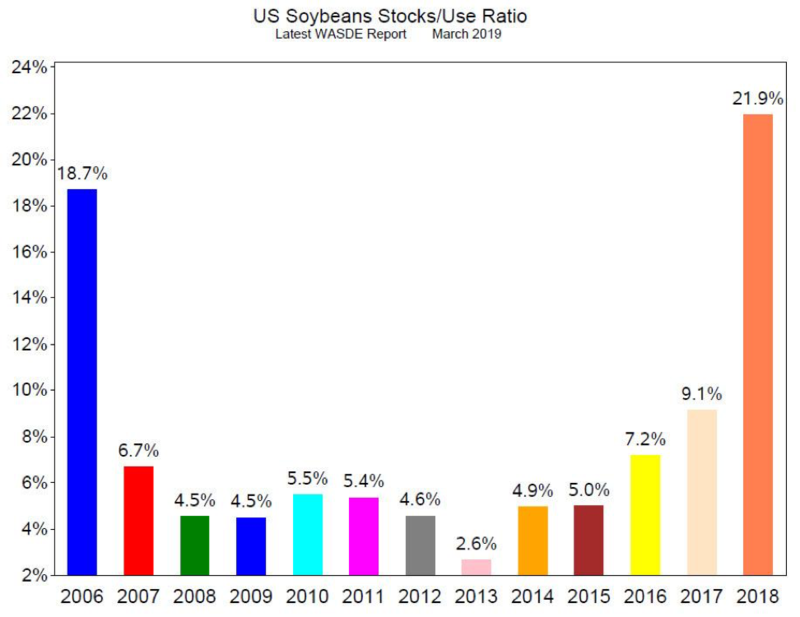 While March crude futures settled up about 90 cents today, there remains downward pressure on prices from increasing concerns over the US-China trade negotiation and slowing global economic growth. 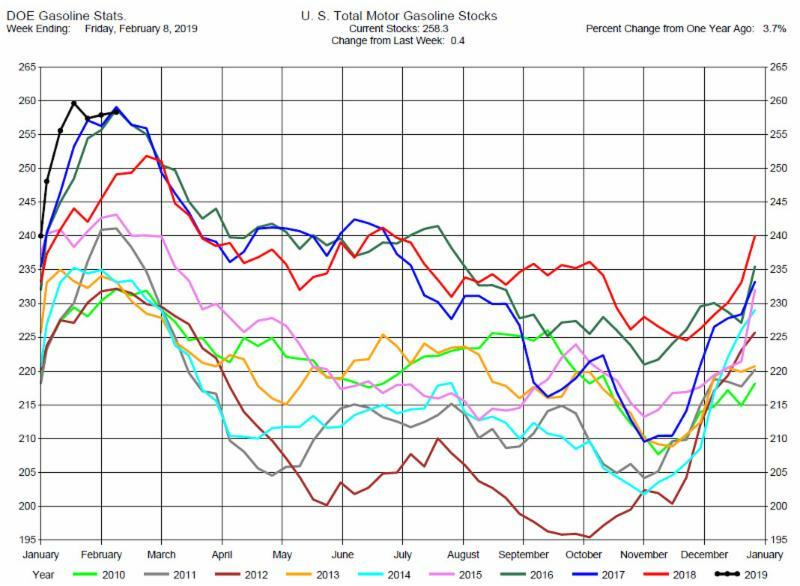 Total MotorGasoline Inventories increased by 400,000 barrels to 258.3 million barrels for the week ending February 8, 2019. 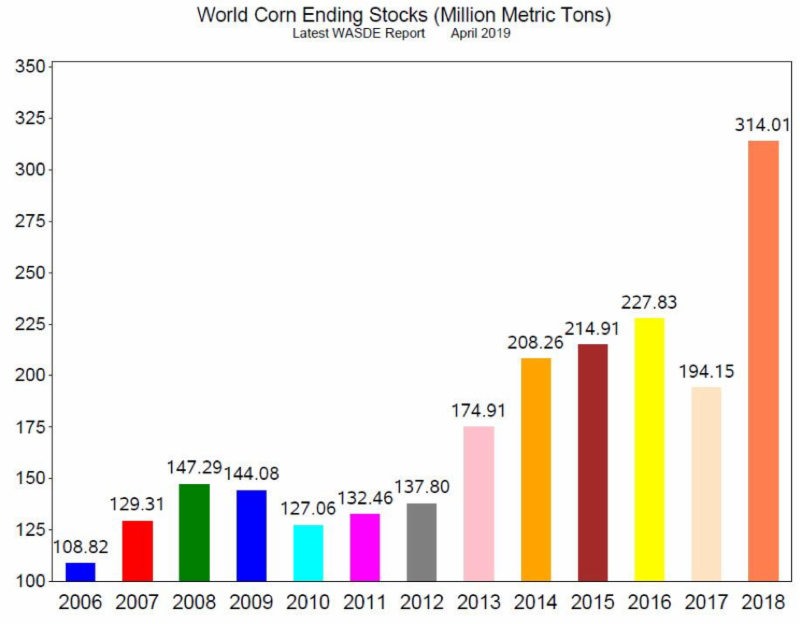 The expectations average was for an 800,000 barrel increase. Implied Demand was down by 390,000 barrels per day to 10.0 million barrels per day. 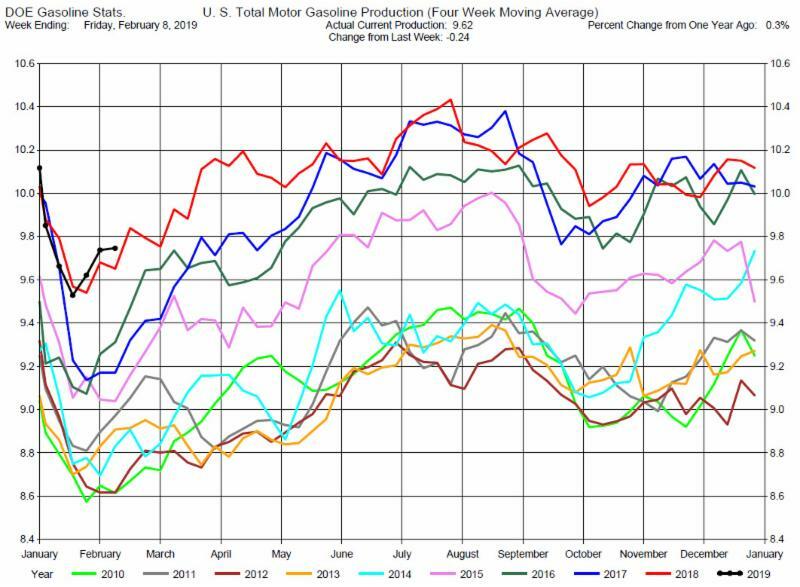 Gasoline Production decreased by 240,000 barrels per day to 9.62 million barrels per day. 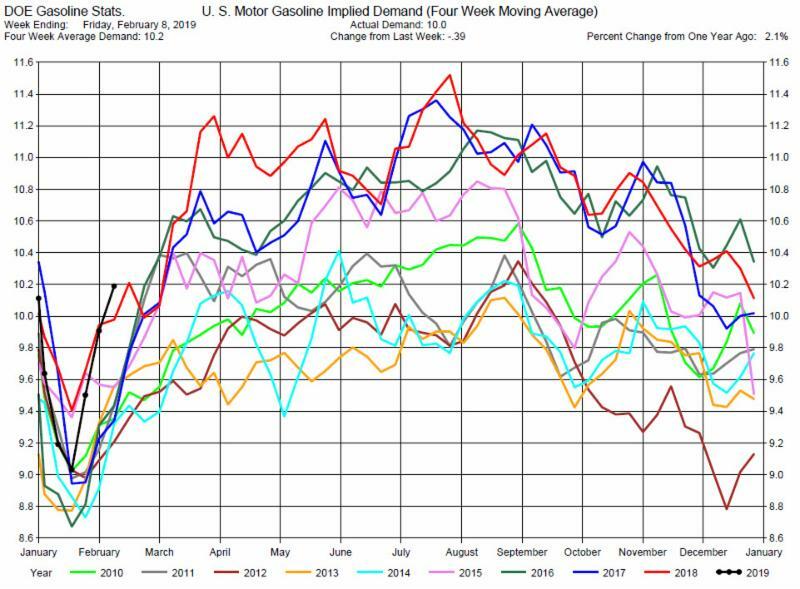 The DOE report was moderately bullish to gasoline prices with the relatively strong demand for this time of the year. 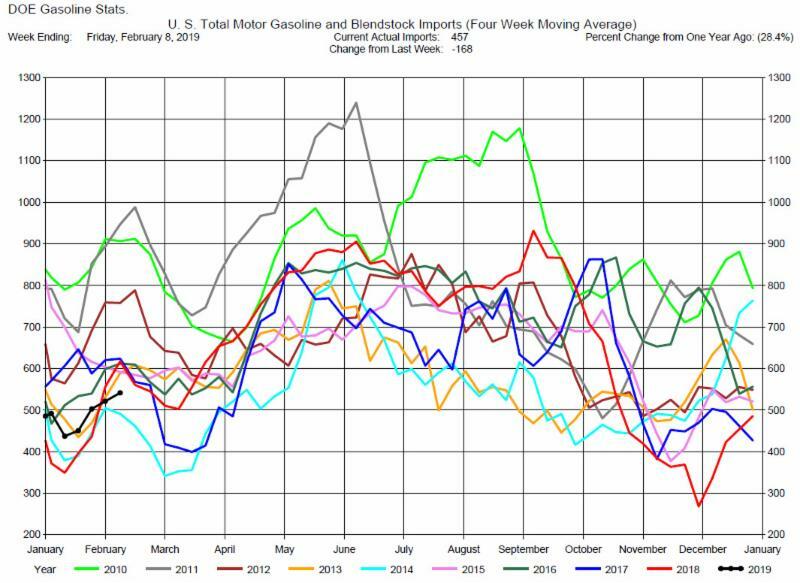 Gasoline prices rallied with the report release, stronger than crude, so the gasoline crack improved. 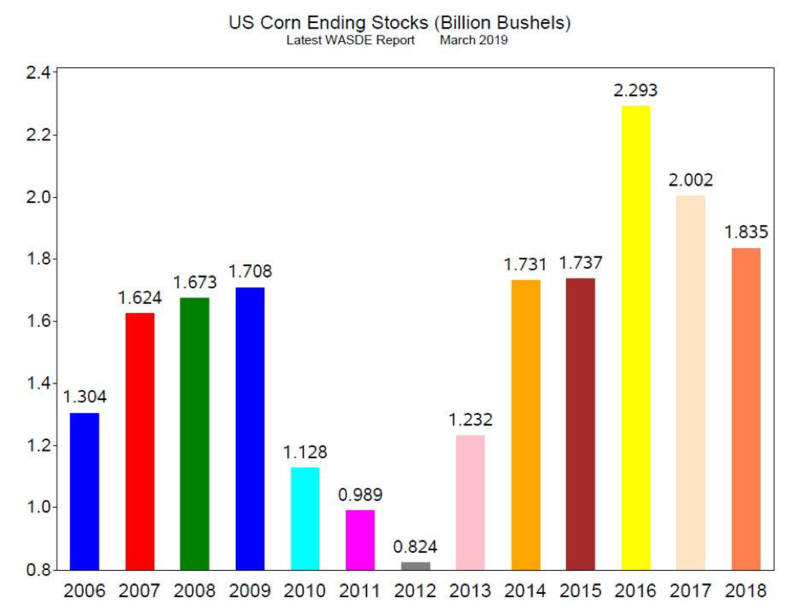 However, the margins are still not profitable. 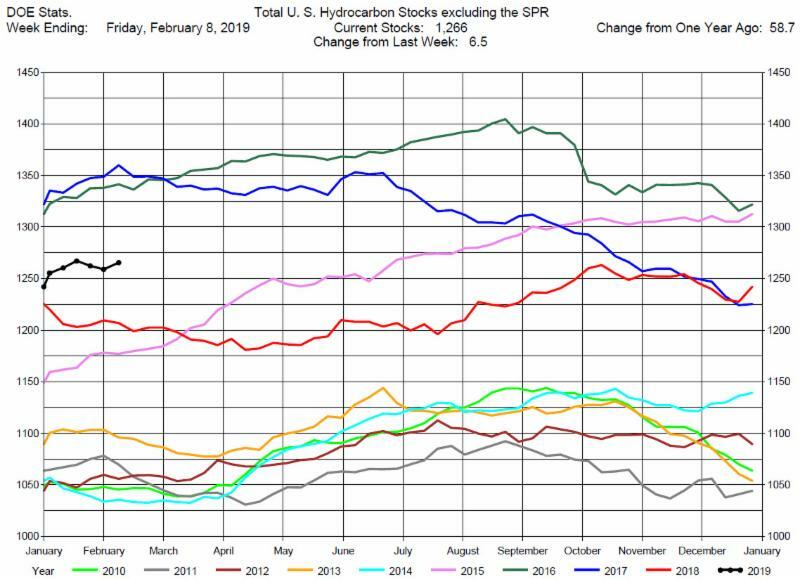 Distillates Stocks Build, Expectations were for a Draw. 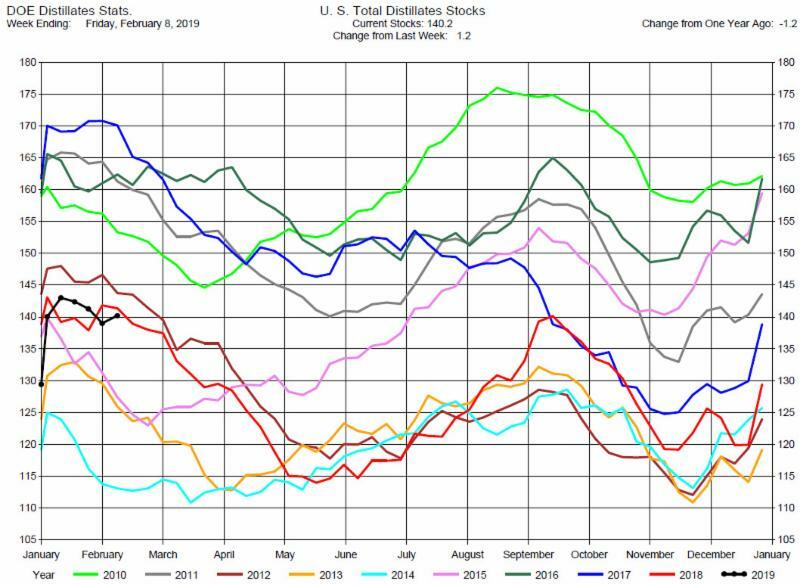 Total Distillates Stocks increased by 1.2 million barrels to 140.2 million barrels for the week ending February 8, 2019, while the expectations average was for a 1.1 million barrel draw. 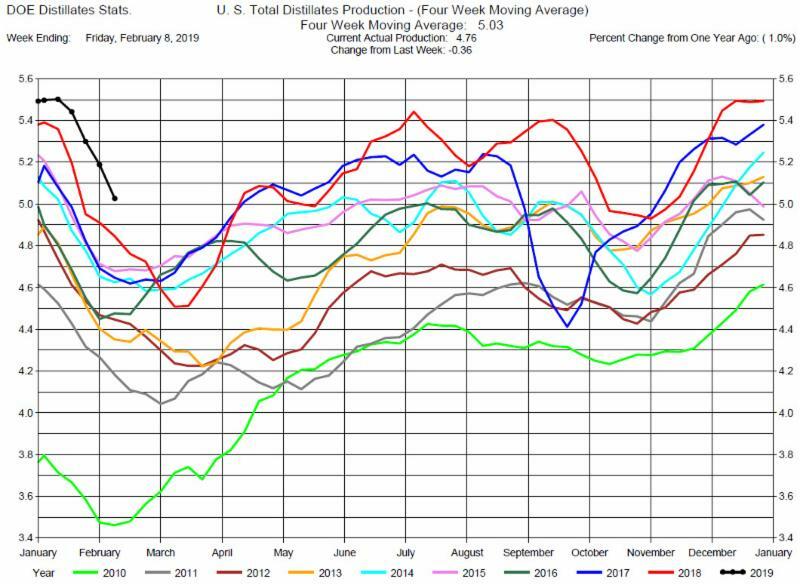 Total Distillates Production was down by 360,000 barrels per day to 4.76 million barrels per day. 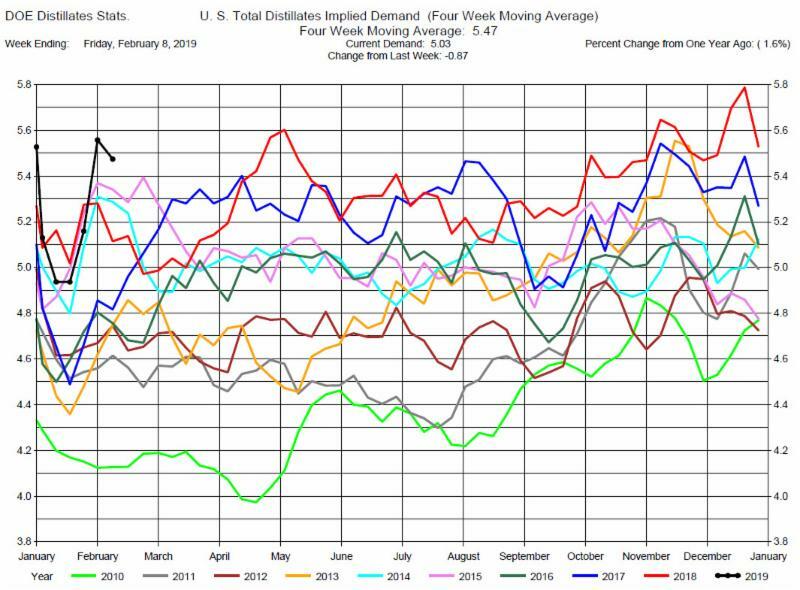 Total Distillates Implied Demand decreased by 870,000 barrels per day to 5.03 million barrels per day. 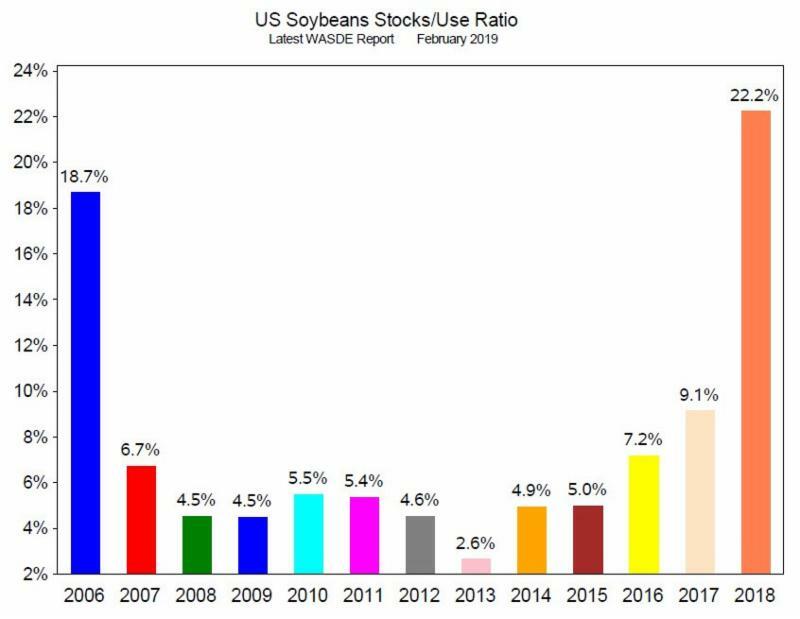 The DOE report was bearish to distillates prices. Heating oil prices dropped from the day’s high with the report release. However, the heating oil prices remained positive for the trading day, and the March heating oil crack spread is greater than $27. 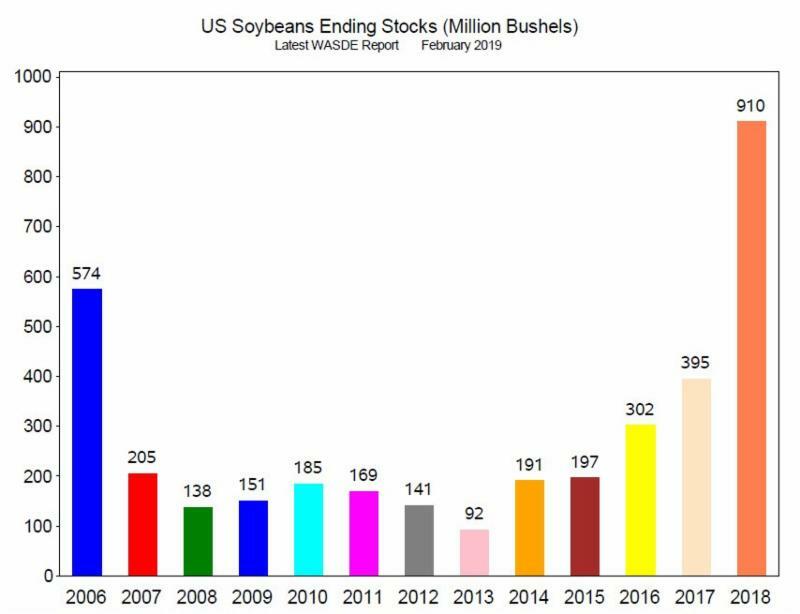 Last Friday the USDA issued the February WASDE report. 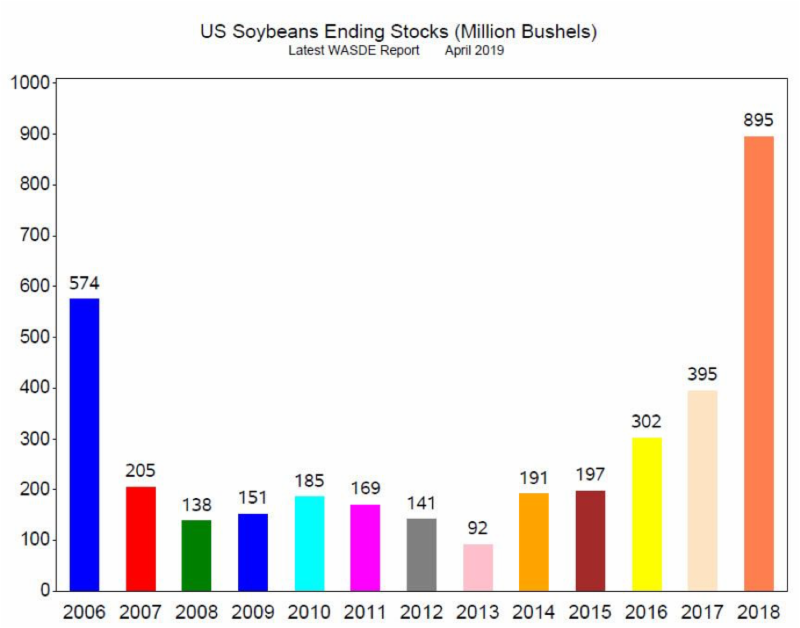 In general, there were no unanticipated data contained in the report and so no major price reaction with the release of the report. Corn Ending Stocks were 1.735 billion bushels, while expectations were for 1.708 billion bushels (Chart 1, 2018 bar). 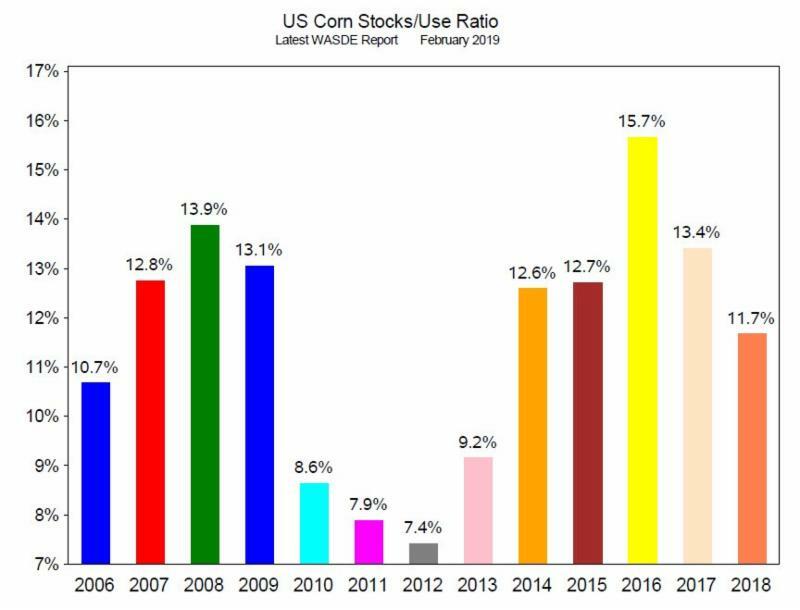 The Stocks to Use ratio was 11.7% (Chart 2, 2018 bar). 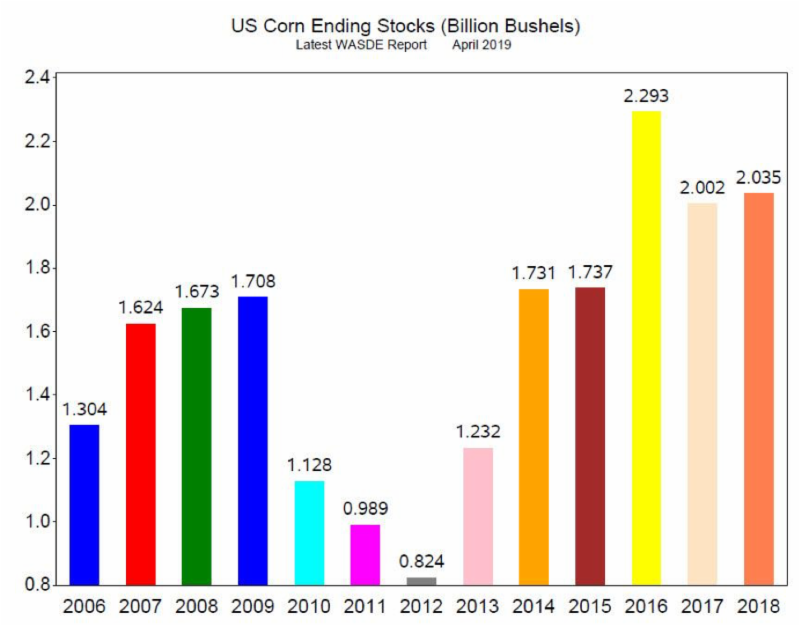 While not strongly bullish, the data are supportive of corn prices. 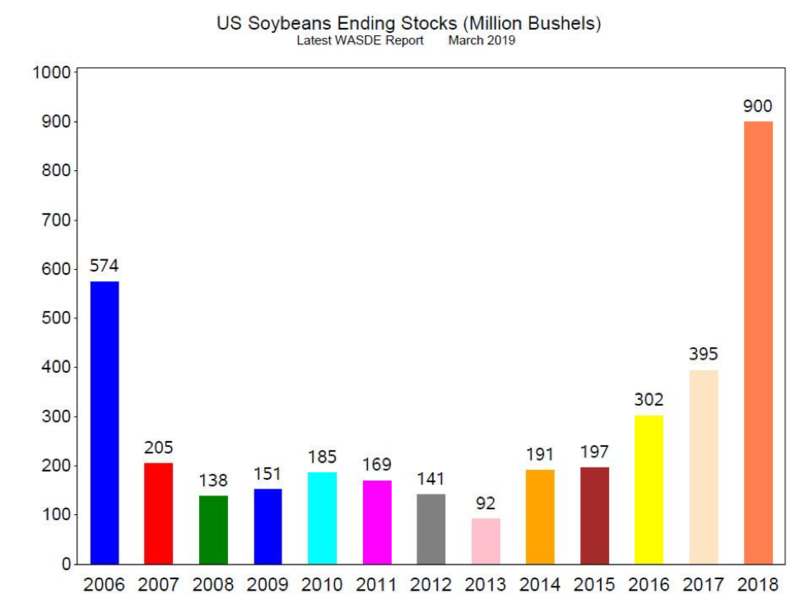 Soybeans Ending Stocks were 910 million bushels, while expectations were for 955 million bushels (Chart 3, 2018 bar). 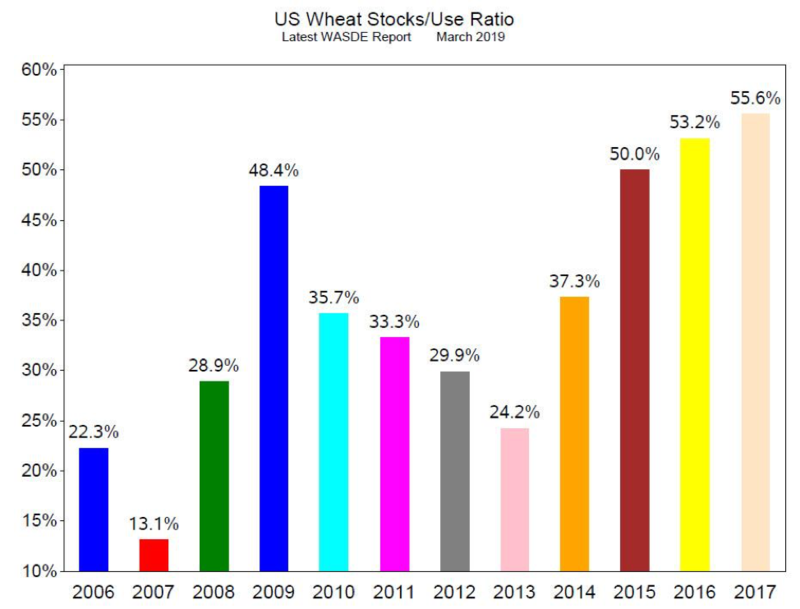 The Stocks to Use ratio was 22.2% (Chart 4, 2018 bar). 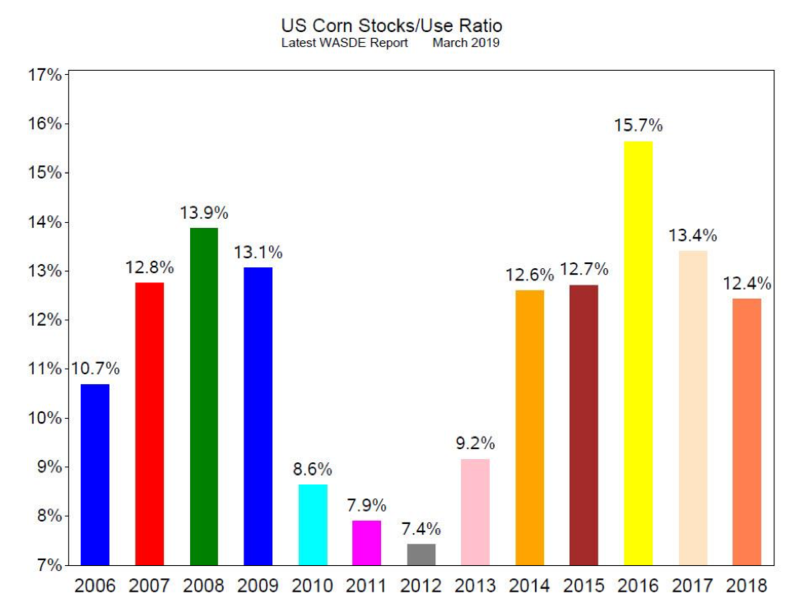 The data remain bearish to prices with record Ending Stocks and record Stocks to Use ratio. 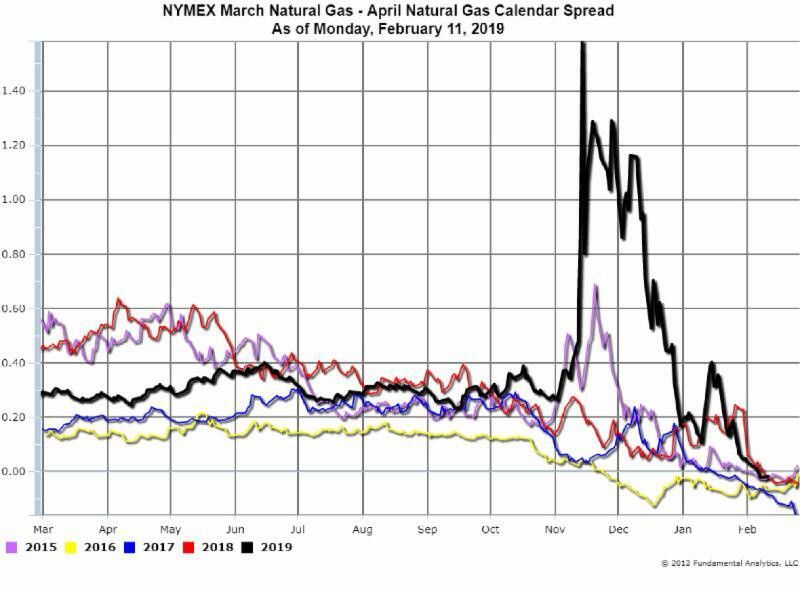 Despite colder than normal weather, the March-April natural gas calendar spread is now negative with April futures trading higher than March futures (Chart 5, black line). 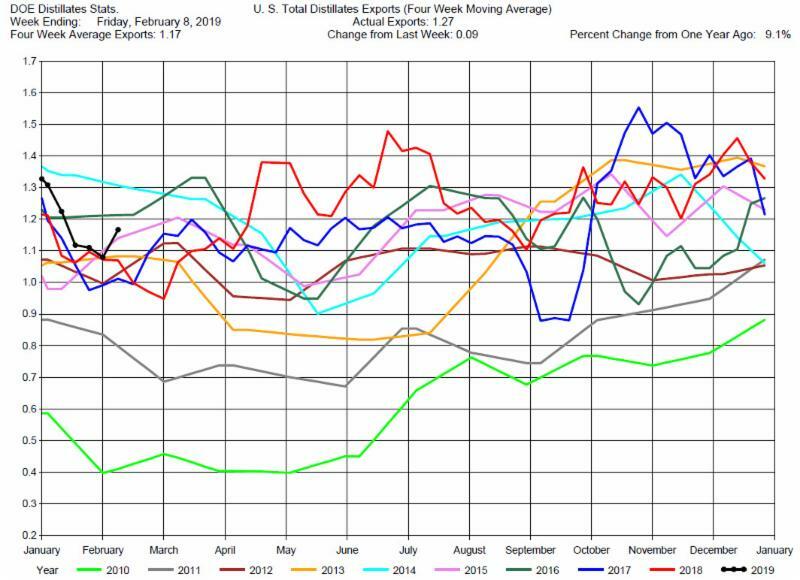 Traders currently believe natural gas supplies will be sufficient for natural gas demand during February. 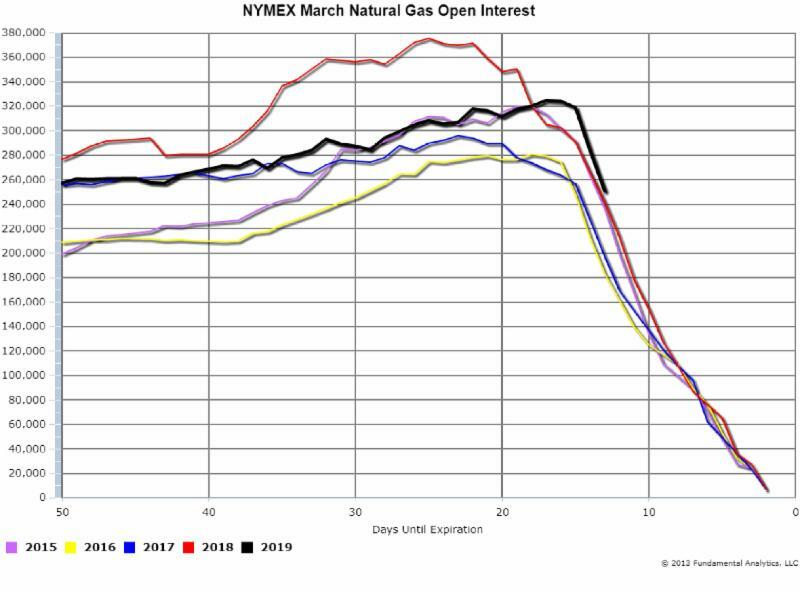 The March natural gas futures contract open interest has recently begun a steep decline (Chart 6, black line). Open interest decreasing while prices are dropping is usually an indicator of longs exiting the market. 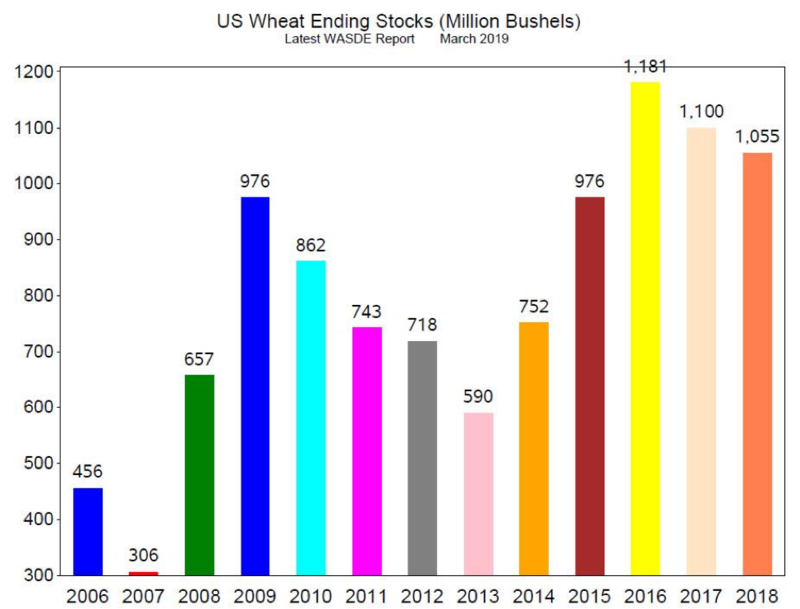 This will put pressure on prices causing the March-April calendar spread to become more negative. 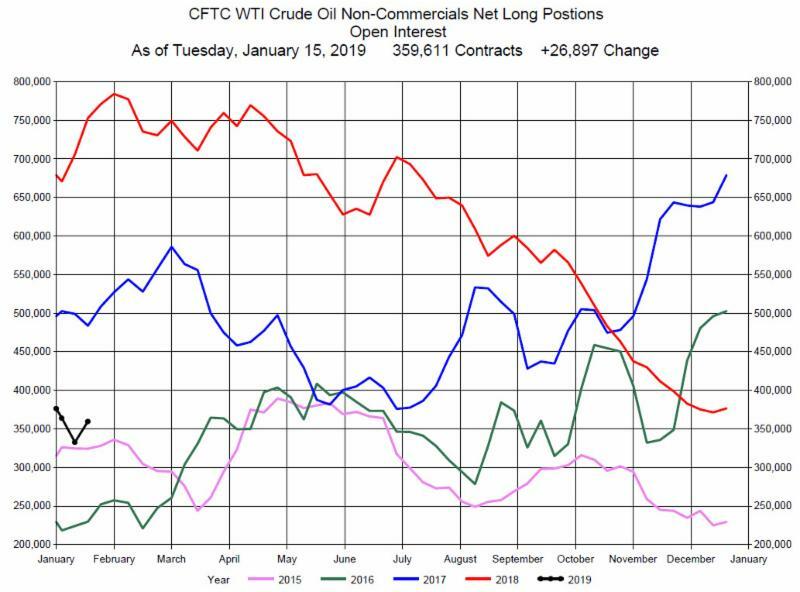 The CFTC Commitment of Traders Report as of Tuesday, January 15, 2019 shows the Non-Commercials Net Long Positions increased during the week by 26,897 contracts to 359.611 contracts. 6,343 Long positions were closed and 33,240 Short positions were covered.